Who you can speak to in confidence. You do not have to give your personal details, but please be aware the investigation and ability to prosecute the offender(s) is severely limited if the police cannot contact you. Contact your local police force, either by telephone or by visiting your local police station. Details on how to contact your local police force can be found at www.police.uk (opens in new window). You can report online using the facility on this website. Go to the 'Reporting online' page (open in new window). Local agencies such as the Citizens Advice Bureau, Community Voluntary Services etc can also report the incident on your behalf and provide you with advice and support. The 'Organisations that can help' page has a list of organisations that may be able to help you. 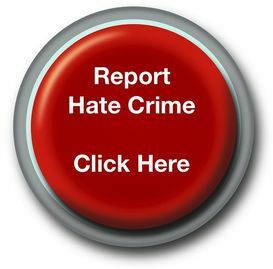 If you do not want to talk to the police or fill in the reporting forms, you can still report a hate crime by calling Crimestoppers on 0800 555111 or via their website at www.crimestoppers-uk.org (open in new window). You do not have to give your name and what you say is confidential. It is free to call. These incidents may involve physical attacks, verbal abuse, domestic abuse, harassment, damage to your property, bullying or graffiti.